On September 16, 2009, join the Human Rights Project in celebrating 10 years of domestic human rights work. 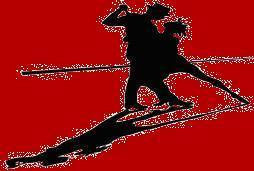 We will have an evening of Tango for Human Rights replete with Tango performance and competition. 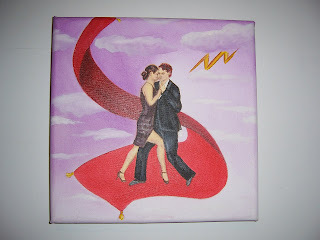 Click on the name of the tango dancer you want to support. "Do you remember how we danced that night away"
That's right! My son - Ruben - the darling of the tango - is turning 16. Come tango the night away with El Guapo del Milonga with birthday cake & champagne. Special class (all levels) with Helen La Vikinga. 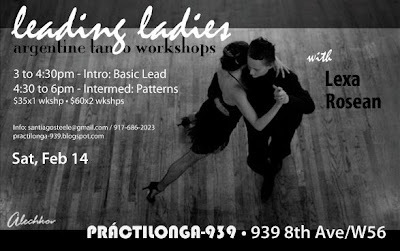 Helen "La Vikinga" has been teaching tango since 1992 in Sweden, and since 2005 in Buenos Aires. 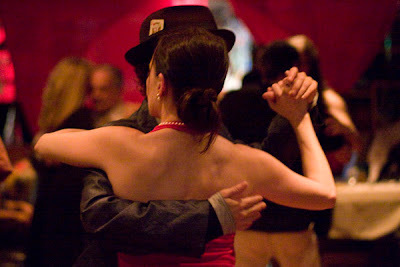 Helen works with the Argentinian tango as a dance, as an expression, but most of all as a communication and as a connection to the other, both in the leader and in the follower role. Helen teaches from traditional tango to "queer" tango and everything in between. 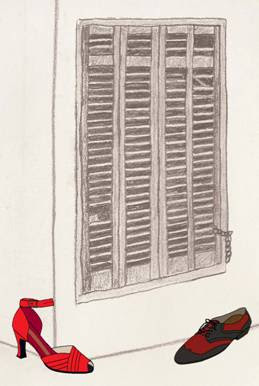 The most important is to be able to communicate to the other and enjoy the TANGO! 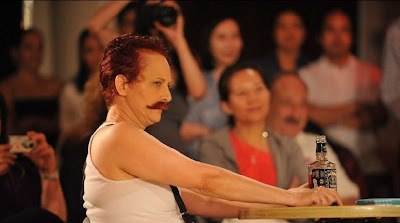 She started early to dance both roles in the tango and became well known as La Vikinga at the traditional milongas in Buenos Aires for dancing the 'man´s" role. Helen has been organizing in Sweden, the milonga Libertango and in Buenos Aires the milongas La Vikinga (one of the first alternative milongas in Bs As), Italia Unita, Bien Pulenta and Mano a Mano (open minded traditional milonga). In her own tango school, Escuela La Vikinga, she teaches both group and private tango & milonga lessons alone or with Javier Guiraldi. 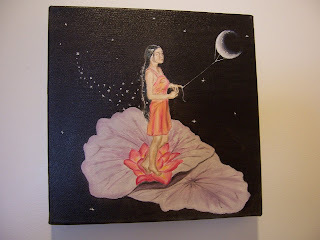 Beside dancing and organizing tango Helen designs and produces La Vikinga Shoes and Sneakers. PERFORMANCE WITH La Vikinga & Lexa! Champagne! Come and Celebrate Autumn. Ritual Tango Ceremony and Harvest blessing for Prosperity bestowed on all dancers by High Priestess and Witch Lexa. Mix of traditional. alternative, & nuevo sets. 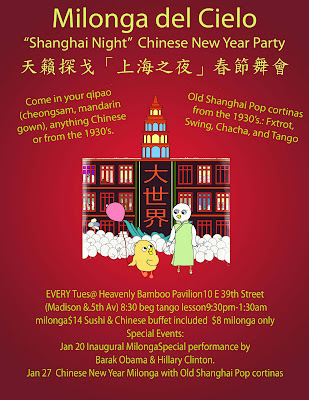 If you make it to this milonga - you've been sealed in SEFER HA'CHAIM (the Book of Life). The Jewish New Year & Yom Kippur having concluded - Baile Chai at Cielo. Yiddish cortinas/Yiddish, Russian, Polish tangos and traditional Argentine tango sets. We are also celebrating the birthdays of Michelle DeBlasi and Jean Migdal and wishing Lexa a Bon Voyage as she heads off to Hamburg Queer Tango Festival. Lexa is honored to be teaching and djing at Hamburg Queer Festival. Here is the link to check out this amazing weekend. A Rund ums Kreuz - Spielereien & Variationen mit vor- und hinterkreuzen. In diesem Workshop werden verschiedene Möglichkeiten des Kreuzens vermittelt, incl. ‚Cruzada Porteno’ und Hinterkreuzen, auch außerhalb der traditionell getanzten Base. Zusätzlich werden wir uns das Gehen an der ‚anderen’ Seite der Folgenden sowie das Wechseln der Seiten vornehmen unter den Gesichtspunkten Leichtigkeit, Rhythmus, Verbindung und Grazie. Anleitungen für klares, sicheres Führen (und Folgen). Lexa Roséan is the 2008 US Argentine Stage Tango Champion (along with partner Gayle Madeira). 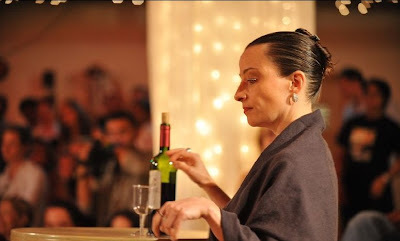 Lexa also placed 3rd in Salon Tango for 3 consecutive years and was the first woman to receive an official invitation from the Argentine Government to dance the lead in the Mundial (World Competition). Lexa began learning tango in 1995 and her first teacher was Brigitta Winkler. She continued studying with many of the great Argentine maestro/as including Omar Vega, Carlos Gavito, Nito y Elba, Susanna Miller, and Alicia Cruzado. Lexa taught at DanceSport, and now teaches privately, as well as djs, and performs - but her most favorite aspect of Argentine tango is to dance socially. 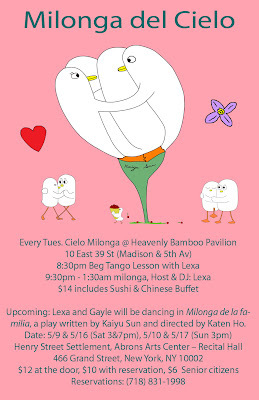 In 2007/8 she hosted NYC's only gay/lesbian milonga at Rubyfruit Bar in the West Village. 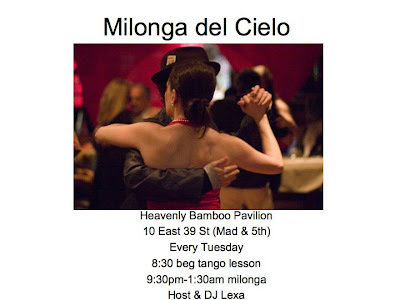 Her current Milonga del Cielo is open to ALL tango lovers regardless of their sexual preference. Discount for students, unemployed and students of PHYNIXtanzt and Queer Tango Berlin. Single dancers welcome! we help finding a dance partner. Lexa Roséan gewann 2008 zusammen mit ihrer Partnerin Gayle Madeira die US Meisterschaft im Tango Argentino-Showtanz. Sie machte drei Mal hintereinander den dritten Platz im Salontango-Wettbewerb und war eine der ersten Frauen, die auf offizielle Einladung der argentinischen Regierung den führenden Part bei der Weltmeisterschaft (Mundial) getanzt hat. Lexa tanzt seit 1995, ihre erste Lehrerin war Brigitta Winkler. Später lernte sie bei vielen der großen argentinischen Lehrmeister_innen wie zum Beispiel Omar Vega, Carlos Gavito, Nito und Elba, Susanna Miller, Alicia Cruzado. Lexa unterrichtete Tango Argentino bei DanceSport und gibt nun Privatunterricht, arbeitet als DJane und tritt auf, aber am liebsten tanzt sie den Tango Argentino nur zum Vergnügen. 2007/8 veranstaltete sie New York Citys einzige lesbisch/schwule Milonga in der Rubyfruit Bar im West Village. Derzeitig organisiert sie die Milonga del Cielo, die ALLEN Tango Liebhaber_innen, unabhängig von ihren sexuellen Präferenzen, offensteht. Ermäßigungen gelten für Schüler, Studenten, ALG II und Schüler von PHYNIXtanzt und Queer Tango Berlin. Einzelanmeldungen willkommen! Wir sind gerne behilflich bei Tanzpartnervermittlung. Bitte unbedingt anmelden, da die Teilnehmeranzahl limitiert ist! "Men are from Mars, Women are from Venus" (with title also in español). 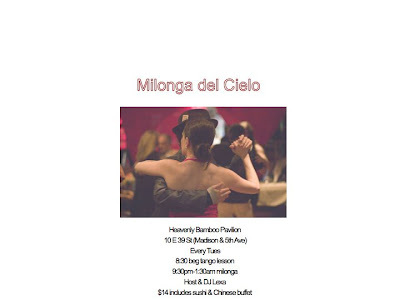 Milonga del Cielo will be taking a pausa for 2 weeks. 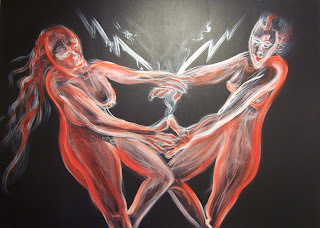 with a special Queer Tango Art Opening and Exhibition by Con Artist. Click here to read Lexa's interview in Reportango magazine.